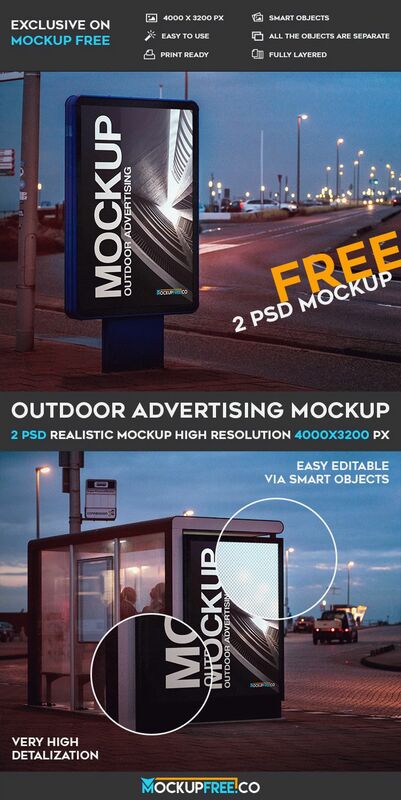 We would like to draw your attention to our new 2 Free PSD Mockups – Outdoor Advertising! There are 2 professional PSD Free mockups for you to be professional in your work and interesting graphic design ideas. All the free PSD Mockups from MockupFree can be customized in Photoshop. It is important to have some basic knowledge of this program. But, there is a huge amount of teaching material, since this program is one of the most popular all over the world dedicated to graphic design and many others. If you want this mockup to become part of your professional idea or it can be great for promoting your product, project or business idea – download it and make it useful for your awesome ideas. We sincerely hope that our free mockup PSD will be necessary for you, your company or your clients and bring you lots of positive benefits in future. Download and enjoy Free PSD mockups and make all the needed customizations and modifications. Hope Free Outdoor Advertising mockups will be useful for you. Have a great day!